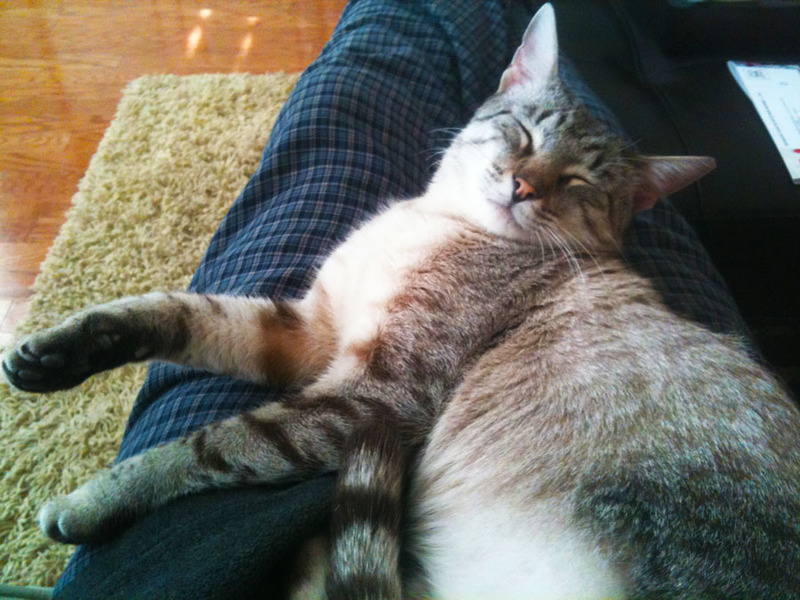 My little Fuzzle cat has gone missing without a trace. She’s been gone since this past Tuesday. She’s the kitty in the first picture I put on this blog, who was there with me last Thanksgiving when I made my first pie. She is heaven-knows-where. It makes me sad as I write this post. I want pie to associate with happiness and The Yum. But I cannot help wonder where she went, how she went and whether she’s ok, or at peace. 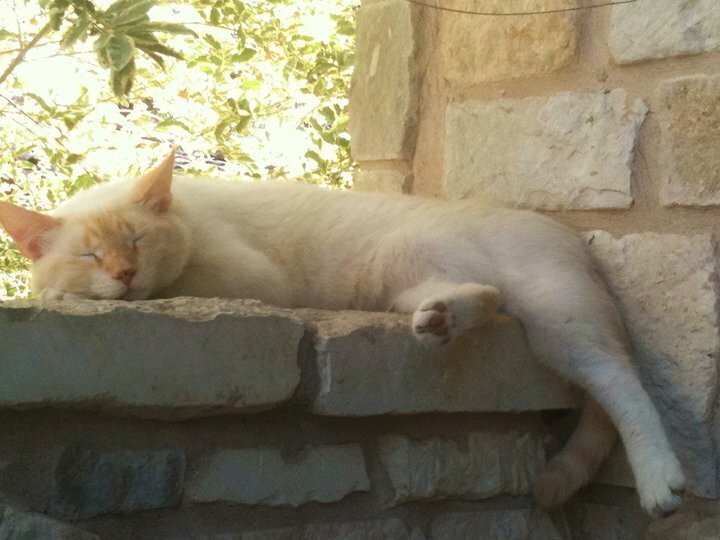 Fuzzle, I hope you come home. And if you do you’re grounded. 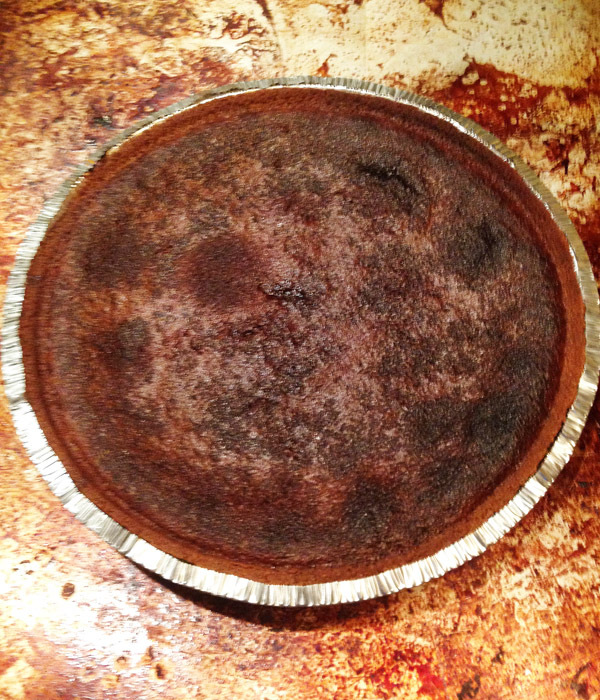 Today, I decided to try a recipe from Kate Orenberg’s Summer of Pie blog here on WordPress. It won’t be the last. She’s got the pie thing going on. This weeks selection is Death by Chocolate pie. And people, it’s Chocolate. The crust is a brownie, the filling is chocolate pudding (home-made of course) and the topping is a chocolate ganache and chocolate whipped cream topping. It’s also garnished with chocolate:) Please note the recipe is copied almost in its entire original form. She’s also a sharp writer. Thanks, Kate. Butter and flour a 9″ deep dish (2 – 2 1/2″ deep) pie pan. In a medium-sized microwave safe bowl melt the butter. Add sugar and stir until combined. Stir in cocoa, salt, baking powder, and vanilla. Add the eggs and beat until smooth. Add the flour and chips, and stir until thoroughly incorporated. Spoon the batter into the prepared pan, being care to bring it up the sides and over the top slightly. Make as thin a layer as you can as the batter will rise in the oven. Place in the refrigerator for 30 min – 1 hour to set. Heat 6 oz of cream in a small saucepan over medium/low heat until steaming, but not boiling. While cream heats, chop chocolate into small pieces (fine) and place in heat-proof mixing bowl. When cream is steaming, pour onto the chocolate. Mix until thoroughly combined and allow to cool to room temperature. You want the ganache to set up a little so it’s no longer liquid, but not so set up as it would be difficult to fold into the whipped cream. In a separate bowl, whip the remaining cream until it holds stiff peaks. 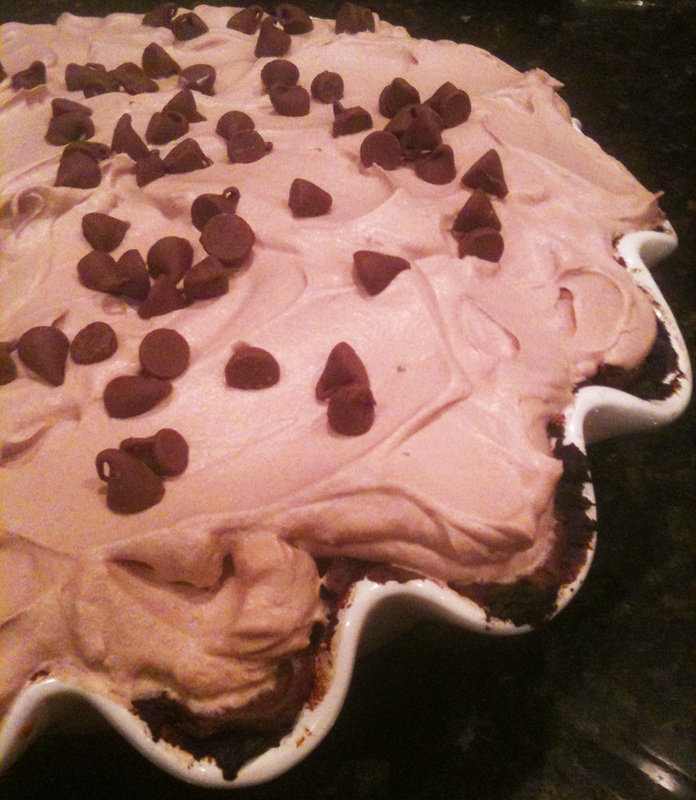 Fold into chocolate mixture, then gently spoon into chilled crust. Wrap in plastic and chill overnight or for at least 3 hours. I only used 4 oz. of the bittersweet chocolate. I’m glad I did. The ganache almost ran off the top of the pie. Delicious but messy. I’m also a poor judge of determining how thick the ganache should be before folding in the whipped cream. Pour cold cream into a large bowl. Add vanilla and rum. Sift in cocoa powder and sugar. Blend with a hand mixer on low until all the dry ingredients have been incorporated; whip on high until cream has the consistency of a soft frosting. Spread gently on top of pie. Decorate with a handful of mini chocolate chips, grated chocolate, or dusted cocoa powder. Chill until ready to serve. This pie is, ummmm, chocolatey. Super delicious if you are a fanatic about chocolate. And I am. 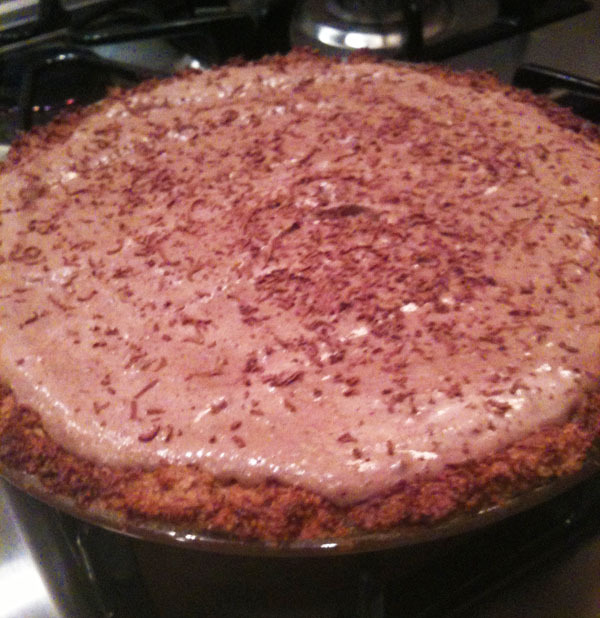 Epilogue on the Shoo Fly Pie, it is NOT as good cold as it is warm. 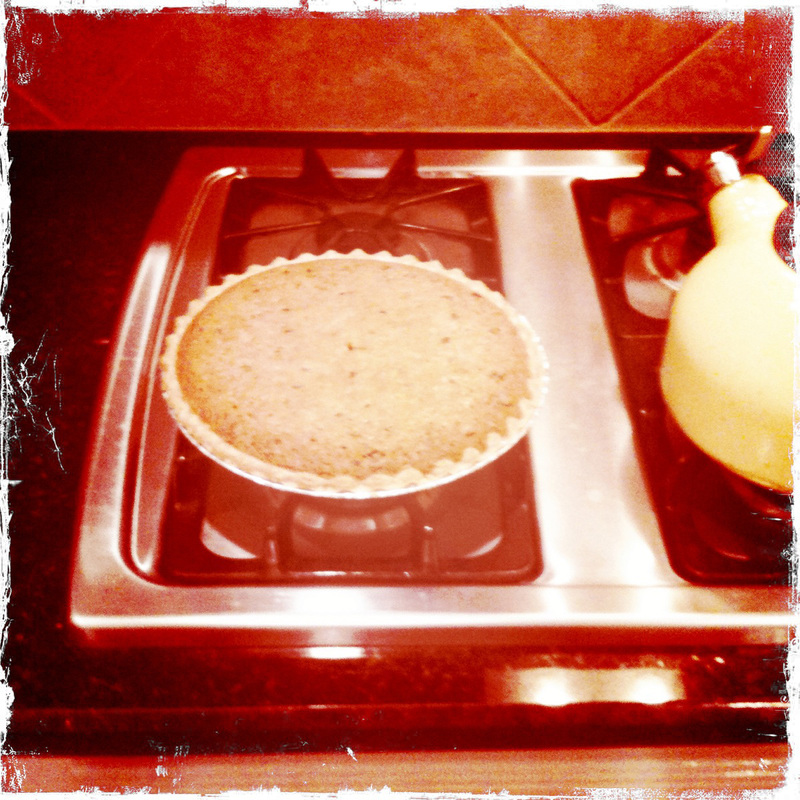 My first epilogue on a pie. It was also the first pie to end up in the trash. And I made two! Blah. I hadn’t heard of the pie until my late 4o’s. Another first. I won’t be doing this one again in this lifetime…the last…did I say blah? Which brings us to a very good-in-an-evil-way kind of pie, ZTejas Ancho Chili fudge pie. I was having a conversation with Candy (a colleague from work) and she kindly asked how the pie adventure was going. I gave her the high notes and she suggested the pie I’m doing this week. I was told it’s very tasty and the menu is simple. Thank you to jaeleepoms of Mason, Ohio for this one. It comes from grouprecipes.com. For Ancho Chili Puree – Remove the seeds and stem from one ancho chile pepper, place in a small saucepan with water to cover. Bring to a boil and simmer until ancho is tender. *Go old school by mashing it through a strainer with a wood spoon. Or use a food processor. Pre-heat oven to 325°F. Toast the chopped nuts until lightly brown. Melt the butter and let cool to warm. Beat eggs well and then add sugars and flour. Beat until smooth. Add warm butter to the batter and mix well (it is important for butter to be warm so chocolate chips will melt some). Pour filling into pastry shell and bake for 45 to 60 minutes at 325°F until done. To see if its done, stick a toothpick into center of the pie. If it comes out clean, it’s done. My wife and I tried it when it was still warm. It was like eating a big gooey cookie! We didn’t get a lot of the ancho chili taste though. Still, it’s really good.